The great designed Ez-Adjustable 2-end leash lanyards come with 5/8" heavy duty pre-printed pattern polyester straps. 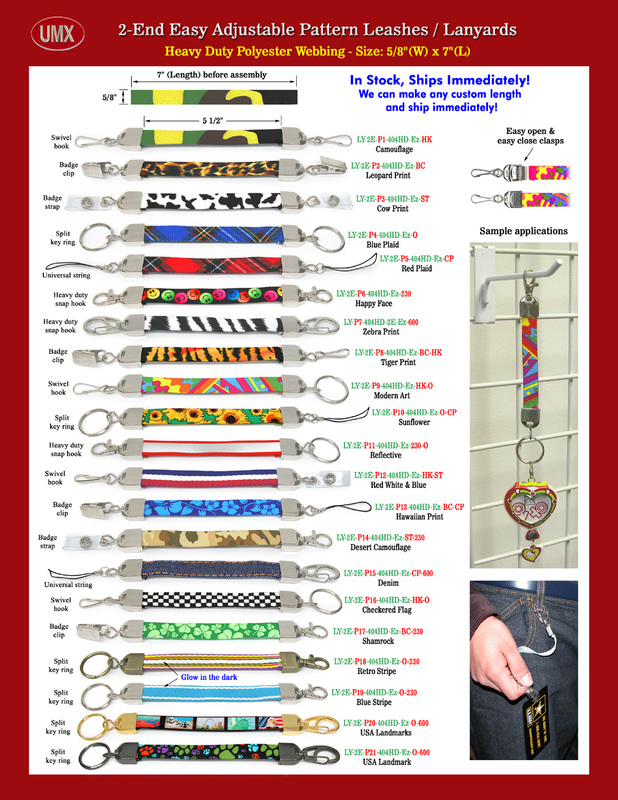 More than 20 unique designs and pre-printed pattern lanyard strap in stock, can be made right away according to your specific requirement. No matter it is custom length or custom combination of hardware attachment, we can make it for you and ship right away. Each end can come with a variety of hardware selection. You can select same kind of hardware or different combination of hardware at each end to fit your specific application. We provide a large selection of hardware to match your special projects. More great designed patterns are coming, please check our web for more information. Any custom size, length, material, hardware attachment, custom logo and custom imprint are welcome!